Don't be fooled by the compact size of the RT8PT Tube, this amplified and vented bass tube is designed to deliver bass like only MTX can. This low profile unit can be installed in virtually any vehicle without sacrificing space. The 8" subwoofer, integrated amplifier, and vented enclosure delivers bass you have to experience to believe. Everything you need for a great bass system is in this package except wire! 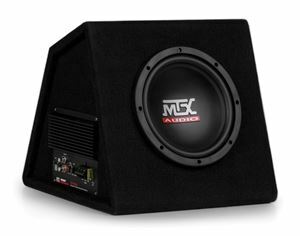 The RT8PT is the perfect solution for enthusiasts that want to put some bass in their system without having to put two 12"s in the truck. This single 8" subwoofer in a vented enclosure, is the perfect way to enhance your vehicle's sound system to give it that extra bump everyone loves. 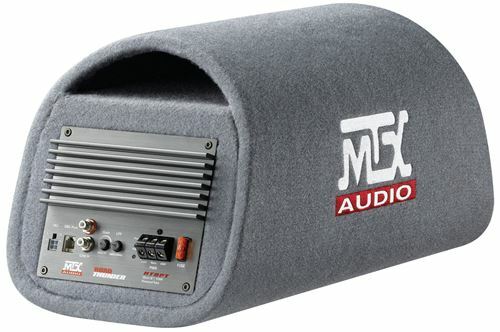 The RT8PT is fully integrated with a 100-watt amplifier built into the enclosure. Connections are easy to make using either the high or low level inputs depending on what source unit you are using including a factory radio. The external bass control enables you to adjust the bass level from the driver's seat so you can always get the best sound no matter what you are listening to. The RT8PT's small footprint make it ideal to install in almost any vehicle, from a SUV to a 2-door convertible. Tie down straps are included in the box to make sure you can easily and safely secure the unit in the trunk or cargo area of your vehicle. 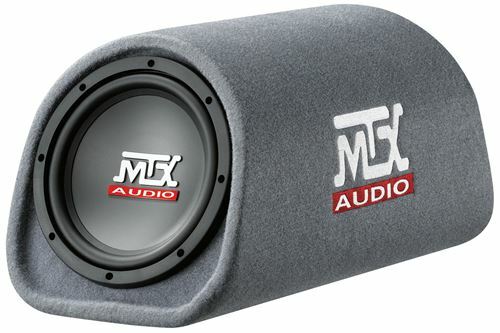 The grey carpet and embroidered MTX logo are an attractive combination in any car.